Alexander Pushkin was born into a poor but distinguished aristocratic family. His nobleman father was active in politics, following a 600-year tradition in his family. His maternal great-grandfather, Abram/Ibrahim Petrov (later Hannibal), was a North African from the area of Eritrea who had been kidnapped as a child and taken to Constantinople as a slave. Abram was brought to Russia on the orders of Tsar Peter the Great, who became his godfather and made him his personal valet and secretary and later a military officer. 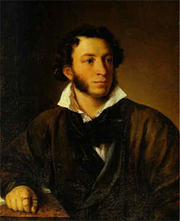 Pushkin was educated mostly at home and began writing poetry when he was very young -- he published his first poem at age 14. He took up writing as a career and was Russia's first professional poet. After 1830, he wrote less poetry and began to focus on the short story form. Many of his works are the basis for other famous literary and musical efforts, including the operas Boris Godunov and Eugene Onegin. In 1831, Pushkin married Natalya Goncharova and the couple had three children, though they were not happy together. Natalya was beautiful and Pushkin thought she encouraged the attentions of other men. He frequently thought himself dishonored and fought dozens of duels, one of which killed him in 1837. His death was considered a great loss to Russian literature. Alexander Pushkin has a Legacy Library. Legacy libraries are the personal libraries of famous readers, entered by LibraryThing members from the Legacy Libraries group. » Alexander Pushkin's legacy profile. Alexander Pushkin's book The Tales of Belkin was available from LibraryThing Early Reviewers. Alexander Pushkin is currently considered a "single author." If one or more works are by a distinct, homonymous authors, go ahead and split the author. Alexander Pushkin is composed of 175 names. You can examine and separate out names.